DESCRIPTION: I have no idea how the tongue appears transparent in this photograph. Some camera trick, I guess. Eyes are yellow. The scales are beautiful. If you need snake removal in your town, click for the National Directory of Snake Removal Companies that I've carefully compiled in every USA city. Facts about the Coachwhip - If you are seeking a unique species of snake, look no further than the coachwhip. This non-venomous animal, considered one of the longest snakes in the southeastern region of the United States, is one of the most uniquely colored. Its long slender body, that can very often get up to 72 inches long, feeds into its patterned tail. The pattern is colored such a way that it resembles a braided whip, hence the name coachwhip. The coachwhip is also considered the fastest species. It is a very skittish breed and will scamper away quickly when approached. The animal is only active during the daytime and when other species seek to find shade from the hot sun, the coachwhip actually enjoys the hot weather. It is a very adept hunter, and is able to hunt solely by sight. It can travel with its head slightly off the ground in order to get a better picture of its surroundings while looking for prey and avoiding predators. It is also very agile and can easily climb trees. There are many myths surrounding this species. One such myth is that coachwhips like to chase people. This likely stems from an instance where both the snake and the person were frightened by one another, and attempted to escape in the same direction. While it is true that coachwhips are fast, and can often move faster than a human being can run, it is not very likely that they will choose to “chase” someone. Another myth centers on a coachwhip capturing and constricting a person, while whipping the person with its tail. This, of course is also false. The coachwhip does not have the ability to capture something as large as a human being, let alone use its tail as a whip. Where Did it Get its Name? Many things have been written about the coloring of snakes and the significance of them. In some cases, the coloring of a snake can determine its name. Such is the case with the non-venomous coachwhip. The coachwhip is a long, slender animal with unique coloring all along its body. It is the only species of snake that doesn’t have some kind of consistent coloration from head to toe. Of course most snakes are not normally all one color, but their coloring usually reflects a gradual blended transition from section to section. The coachwhip is the only one who is vastly different. Its head coloring is jet black, its body can take on a lighter – almost grey appearance, and its tail coloring is a light tan and resembles that of a braided bullwhip – hence its name. These colorations can vary from region to region; the coachwhip can take on variations of colors such as yellow, red, pink, brown, and green depending on its locale. The most common is the eastern coachwhip which is found in the southeastern United States – primarily Florida. It is a fast little snake too and is one of the few species of snake that has the ability to “stand up” while it’s traveling – that is, it keeps its head above ground while it’s moving to be on the lookout for predators and prey. Click to go back to my full Florida snake removal photo gallery. 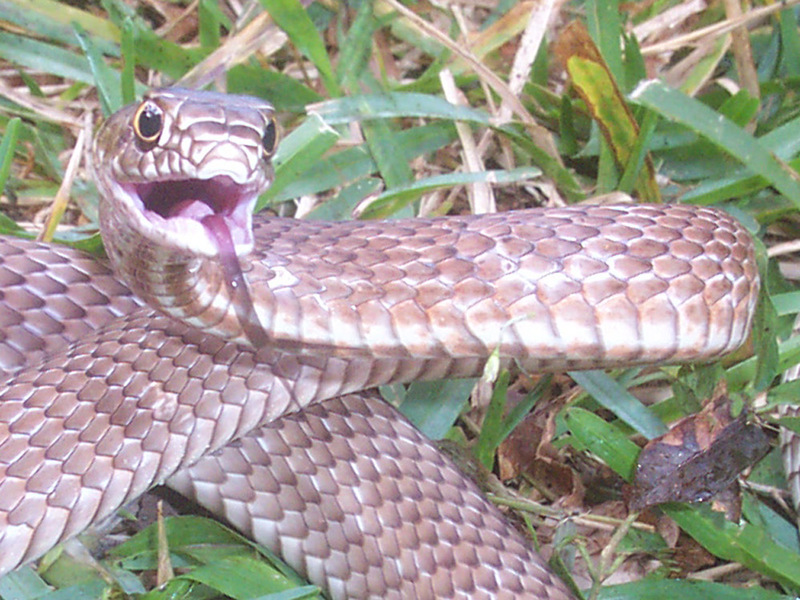 Visit my Florida snake removal journal blog! Lots of great Florida snake stories! Running a wildlife removal business in the state of Florida gives me the chance to see all kinds of interesting snakes! Florida has about 45 species of snake, and I've seen 29 of them so far. I've always got my eye out for new species, and I love spotting rare snakes in Florida. I also have a thing for venomous snakes - they're not too common in FL, so I always enjoy the chance to see a poisonous serpent. I really like snakes, and I've never hurt or killed one. They're an important part of the ecosystem, and often persecuted. Still, if you don't want snakes in your house or on your property, and judging from the number of phone calls I receive regarding snake problems, you don't, then give me or a local snake expert in your area a call, and we can remove the snakes from your property for you. I use many snake control methods - from snake traps, to snake repellents, to habitat modification, but most of all, good old-fashioned capture and removal. If you want to learn more, please read my How To Get Rid of Snakes page. AAAnimal Control is a privately owned wildlife removal and pest control business, located in Orlando Florida. I deal strictly with wild animals including snakes inside houses. I am not an extermination company, but a critter removal and control specialist. The above photos are some of the many that I've taken in the field over my years of work. Please email me if you have any questions about the above photographs, or any questions about wildlife problems or Florida snake removal issues.